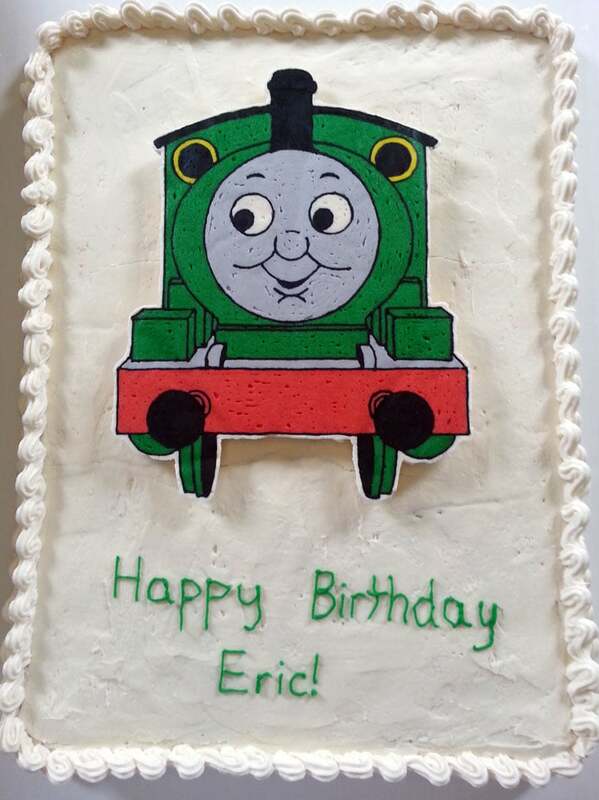 I used my buttercream transfer method to make Percy. However, this yummy cake was almost Percy-less. I made the cake the day before the party. Of course, that is the day I came down with the kids’ cold. The first day of a cold is the worst. I told my husband, I was almost tempted to buy a store-bought cake but I didn’t care for the taste. I toughed it out and got the cake baked. Once the youngest was asleep, I was able to start frosting the cake. That was pretty simple for me to do. By the time it was my oldest’s bedtime, I had placed the cake in the freezer and was ready to start on Percy. So, a few hours later, I was almost done with Percy. I was at 95 percent done. I was placing the last bit of color on him when I turned the transfer and it plummeted to the floor. He fell face first on the floor. This was about 11:30 pm. Tears were shed. My husband sent me to bed while he stayed up till 2 am in the morning to get the outline and all the black parts filled in. Then in the morning I got up and finished Percy. So the cake was finished just hours before the party. Then there was the mad dash to get the house ready for the party. Now, I just need to figure out how far in advance I can make these buttercream transfers so I can possibly avoid this in the future. If you have an idea, please leave me a comment and let me know! Oh my! I probably would have printed out a Percy picture and stuck it on the cake–haha! Very impressive work!! I had a birthday cake disaster once. The cake broke in half. It tasted ok. Looked terrible. Glad you could get it done it time. I totally understand. I didn’t have time to fix my cake. It was too far gone. My mom got a good laugh out of it and has offered to buy cakes since then. Oh no! Glad you were still able to eat it. Aren’t husbands great! Mine helped me years ago with my son’s cake when my morning sickness and baby brain was all to much for me to handle with cake decorating. I would have cried too! Why do we do this stuff to ourselves?! It turned out super cute by the way!